The 2015 annual BBL Spring Festival in association with The North West Musical Festival was held for the seventh time on Saturday 25th April 2015 in the Alley Theatre in Strabane. 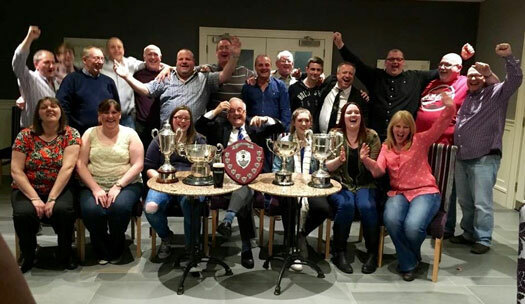 Continuing it's impressive contest run the band achieved a 4th win in a row at this contest (matching the 4 in a row achieved by the band at the annual entertainment contest in Fivemiletown in March) with a winning performance of Goff Richard's "Oceans." The section's soloist prize was also awarded to our principal cornet player today - Morris Cameron. It was further announced that the band had been awarded the overall title of "Band of The Year" for the second year running and had therefore retained the coveted Haughton Cup. The results which the band has achieved over the last few years only comes with hard work, dedication and a willingness to improve. A huge Thank You to all for the teamwork and efforts in striving for this continual improvement and, in particular, our conductor, Des Graham, for his tireless work and belief. A special mention too, to Sam Brodison for his help today for which we are very grateful. We also send our congratulations to all the winning bands and soloists in their respective sections.